A leap day and a leaping cat is good omen for continuing success. Happy Leap Day Everyone! That extra day we get this year to be with our families, except mum went to work as usual so no extra time with her today. But it is Friday so that means we will have the weekend together. Most of it mum says. She has another library meeting tomorrow morning. So when do I get this extra day to spend with her?! But she did get home a little early yesterday. Said she went to a fun work thing and they went curling. Well I curl all the time so what was so special about that. Oh she says curling is a game where she got to throw big heavy rocks down a sheet of ice. She even managed to score one of her teams points. Woohoo. They just played for fun. Well the snow we were supposed to get early in the week wasn't much, but more came over night on Thursday to Friday. The official moving picture box weather guy showed a map the other night. It had colors for how much snow has fallen over this winter season. Our area was the bulls-eye. Over 90 inches of snow and that was before this last stuff. Mum says no wonder the snowbanks are so high and her back is tired! Fevver Friday Some house finches and sparrows feasting on the seed that mum puts out. Mum says this past week with some slightly nice weather they birdies didn't eat quite so much. Not as cold and no snow, guess they don't need to eat quite so much. The Hotties, more formally The House of (Mostly) Black Cats, gave Virginger and me an award. Wow, we are Toadally Awesome. Thank you very much! Well the Cat Blogosphere as a whole is Toadally Awesome and we just make up a small part of it. 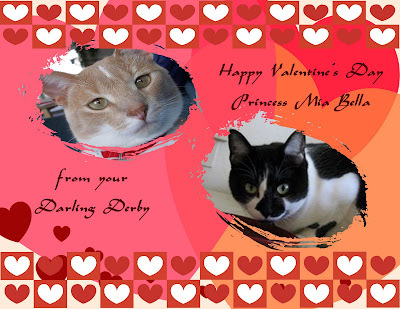 I would like to give this to Darling Millie and her mum, for being such a generous twosome. Making all of the quilts, the auctions for those in need, and the quilts Millie's mum makes are awesome. Oh Yeah, My Gizzy landed and pictures will be posted tomorrow! Hi everyone. If you don't know me I am Virginger. I am the first of the many squillions that now live with many of the wonderful kitties in the Cat Blogosphere. You can see the six of them that we fostered out to our furiends as well: Mandy, Mango, Blackie, Inky, Storm Cloud and Ashes! 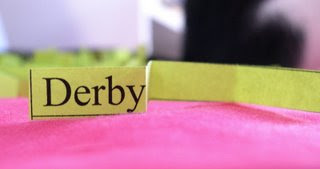 Normally I just tell Derby what is going on and he posts for me. But I decided to be brave and do my very own first post. Thanks Derbs for letting me take over today. 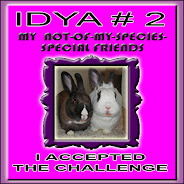 Mum found me at the Green Walls shelter on February 26, 2006 and brought me home to live with her and Derby. I am so happy that I found a wonderful home. Here you can see Derby checking me out for the first time. Mum posted about finding me on February 28, so that is why today is Squillion Day. Now unlike Derby, I get to go outside! So I do the reports from outside about the flowers. So we will sit and chat at the open windows. 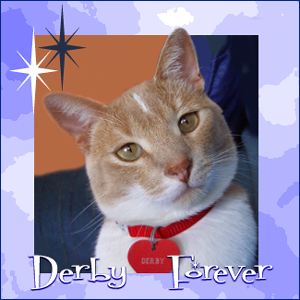 Sometimes Derby does come outside in his portable porch, then we can both see the birdies, squirrels and such up close I have even been outside in the snow, but not this winter. Even I am not crazy enough to be outside in all of the snow and cold that we have had this year. But last winter I did go out with mum when she used the snow eating monster. This winter I have been snoopervising all of the little kitties that mum brings home, some of them mini-Squillions from the same Green Walls shelter that I came from two years ago. It has been such a bad winter even I haven't been going outside. I figure I have my paws full with all of the little ones. Here I am sitting so nicely with the flowers that mum brought home. I respect these lovely things and don't try to eat them or knock them on the floor. Here Derby is again, trying to get the flowers. Derbs, leave them alone. It is probably good mum doesn't let you out in the yard. She wouldn't have any flowers left! Because mum found me and let the world know about me, many of my litter mates found loving homes. When we couldn't find anymore actual Squillions to adopt, then some of you have virtual Squillions, now we have the mini-Squillions. So open your hearts and homes to these little guys. They need homes too! 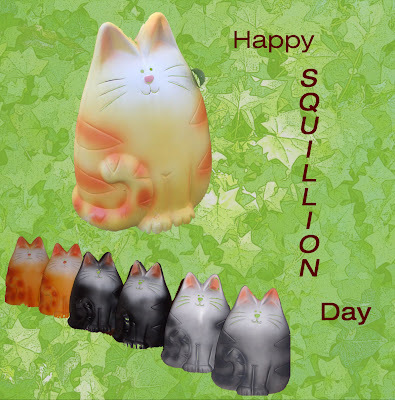 So Happy Squillion Day everyone! Mum says the mums are not naturally these colors, they were dyed to get to this color, blue and purple. Let me at them! Mum puts them in a room overnight and during the day when she is not around. She closes the door so I can't get at them. Then when she comes home she brings them out. I chase her around to get at them and I tried to jump up on top of the stool. I knocked everything over, spilled the water, but nothing broke. Mum again was not happy with me. I can't help myself, I just love to eat flowers! This post is dedicated to Eric, whose mum laughed at him when he lost his balance getting up off a wall. He meant to do that, so don't laugh at him. A ManCat needs to maintain his dignity. I entered the Simply Siamese Spring Contest. Drop by and check it out. I got furry creative with a poem too! To cheer us up mum bought some flowers. I love flowers, they are so tasty so mum has issues with me wanting to get at the flowers. I try every way I can to get them. The tulips to the left are fake! Mum moved them away from this spot later in the day. I managed to knock them over and spill all of the water. Mum did not take any pictures of that as she wanted to get the water up off of the carpet. Plus it is supposed to snow later on Monday and into Tuesday. We had gone almost a whole week without snow. Enough already with the white stuff. I WON the raffle for the Gizzy Quilt for Churchill from Darling Millie WooHOO. We raised $550 for Churchill. Details on Sunday for the raffle for the Meezers. It has been nice and sunny this weekend. So lots of sun spots for me to nap in. Stretch too. Ahhhh. The birdies are hungry little guys this winter. Mum came home with four bags of stuff for them as the cupboard was bare. Mum hopes this load will last through the rest of the winter season. Plus you can see how much snow we have on the ground and the big pile outside the back door. But they are saying more of this white stuff is going to come on Monday. Go away snow! We don't want you to visit anymore. Mum is resting so much she wasn't going to fix dinner at home. But she and Miss Lynn went out and still had to cook their own food. Duh, why go out if you still have to cook? They had all sort of stuff to put in the hot bubbling oil to cook them, then they eat them right away. But then there is nothing to bring home to the starving kittie! Fish, beefs, shrimps, chick-hen! Nothing for me! Chocolate!!!! Mum says it was yummy. She is stuffed and won't need to eat for at least a day! Yes you see correctly! The other day I walked onto mum's lap and sat down. For the first time ever. I have walked across her lap, sometimes even standing on her lap. But I had never before stopped and sat down. I was there for a few minutes, as she had time to reach the flashy box and get photo proof! One picture from the back, the other from above. Mum's flashy box is rarely far away so she can get pictures all the time. On one of my Funky Fang Shui Friday posts you were worried that my tail got hurt while she had gone off to find the camera. Actually I had been helping her pick out her lunch. You can see the big wide spot along the bottom and there is room for me. So I don't get squished and the door closes very softly, so my tail was not actually hurting in any way. But mum has to be careful when she goes to look for her foods. I always want to check out what is in the big cold box. I know that yummy things come from in here, like ham, chick-hen, turkey, beefs, cheese and all sort of other yummy bean foods. 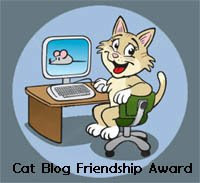 The Girls at 3 Cat Blog gave me an award. Thank you! Now, who to pass it along to. I feel like I could give this to everyone who blogs as we have such a great community of furiends, but here are a few that I pick for being such good furiends to both me and mum. The Piney Woods Cats - Patches, Mittens, Mistrie Rose and Precious Flower, along with Calico Mom Toni. Cat Naps in Italy - I learn all about live in Italy and I keep them updated on football during the season. Fat Eric - My fellow Gorgeous Ginger. All floofy and wonderful who lives in the UK. It is election day here, mum voted, now we have to wait for the results. At least the crazieness on TV and the phone calls will go away for a while. Checking for any cooties that mum might have missed! I smell and hear things that she doesn't! First mum says thanks for the birthday wishes. The only bad thing is that she had to get up early so she could go to her meeting. Something about long range planning for the local library. My long range planning is when I can mooch my next treat! But mum said it was a good meeting. She came home for a while, then went to eat dinner with Grampie. But I teleported down to Florida to be with my M-Cat Club furiends, we even had Sammy Meezer drive as a last minute replacement in the Daytoner 500. Sammy finished 20th. Not bad for a first timer. He beat lots of former champions. Way to go Sammy! Someone asked if we did the Great Backyard Bird Count this winter. Yes we did. Actually mum participates in Project Feeder Watch, so she does the birdie counting every weekend during the winter. If you like to do birdie counts and watching, you can sign up too. They are still accepting people to sign up for this winter until the end of February. Or wait and sign up for next winter! Lots of purrs to my special ladycat, Princess Mia Bella. Happy Valentine's Day to everyone else too. Mum has been busy again with the snow eating machine. Tuesday day she had a late meeting at a different building, it took her 30 minutes to get to the main street from the parking lot (less than a half mile). Then it took her another 30 minutes to drive the other 13 miles! She is glad she doesn't work at that building all the time. But Wednesday we had SUN. I spent lots of time sitting in the windows soaking up the sun beams. But more snow expected on Valentine's Day. The official moving picture box guy says we have had over 6 feets of snow this winter. I will have to get mum to take some more pictures of the big snow banks. We had lots of sun spots but it was furry cold to be by the windows. Mum and I stayed snuggled all inside on Sunday. We had a little bit more snow but mum did not go outside to move it off the driveway. She said it was way too cold. Yes, we had more snow and more snow is expected this week. ENOUGH ALREADY! Patches suggested selling the stuff to make money. I doubt we could even give it away, one of the local malls tried, they had no takers. Mum says the moisture will be good for the plants outside, but she too is tired of dealing with all of the snow. Come on spring, we want to have open windows and be able to be outside without bundling up. Mum went out this morning and came back with foods and some refugee's from the Green Walls shelter in town. MINI SQUILLIONS!!!!! Here are our four new family members, two gingers, a gray and a tuxie. A closeup of the two ginger boys, I think mum will have to let these guys get naked and take off the collars and bells. I don't wear a collar, why should they have to wear a collar. Here is the whole gang, making furiends already with Virginger keeping everyone together. She has quite a job here. While Virginger may keep you in line, I am the top cat around here. Don't forget that little ginger kittie! So if you have been wanting a squillion, go out and check your Green Walls Shelters. Mum says the adoption fees are low and even lower if you adopt at least two of them. Plus don't forget Squillion Day will be coming up on February 28th. Virginger is very excited about this. A chance for her and all of her littermates to post an update. Just to give you an idea of what this place looks like, the picture below was taken on January 29, not quite 2 weeks ago. This is what the same view looks like now after all of the snow. Plus we got 2 inches of more snow Friday night. It is going to get furry cold now too. Mum and Grampie talked, since it will be so cold tomorrow, they will both just stay home and stay inside. Mum is happy as that means she will have more time to rest tomorrow. That means more time for me to get snuggles and scritches with her.